‘I feel I can make so many women happy’ - celebrity Heidi Klum commented earlier in September when asked about her new budget line for Lidl. Let’s first look back to 2015 to see where it all started. Lidl - the top-of-mind discount retailer - decided to take on a new venture and develop its business by offering new product ranges centered around fashion and beauty. To underpin its diversification and move away from discounting, Britain’s fastest-growing grocer spent over £78m on advertising alone, more than any of the big four supermarkets. This media budget was accompanied by an overhaul of its stores and the use of celebrity muses. In doing so, Lidl demonstrated its desire to continue the premiumisation efforts it first began in 2012. In June 2017, Lidl announced a fashion collaboration with supermodel Heidi Klum. Klum’s new fashion collection would ‘mirror her characteristic style’ and would be ‘exclusively available’ at Lidl, to be launched in its global network of stores later in the year. What has made Lidl’s social media campaign unique and what response did they get online? When the budget retailer joined forces with Heidi Klum, it chose to support its #LETSWOW fashion campaign with a dynamic strategy activating fashion influencers on social media, notably Instagram. Lidl’s UK commercial director, Ryan McDonnell, also described the #LETSWOW campaign as aiming to surprise its customers with “trend-led fashion collection at highly competitive prices”. 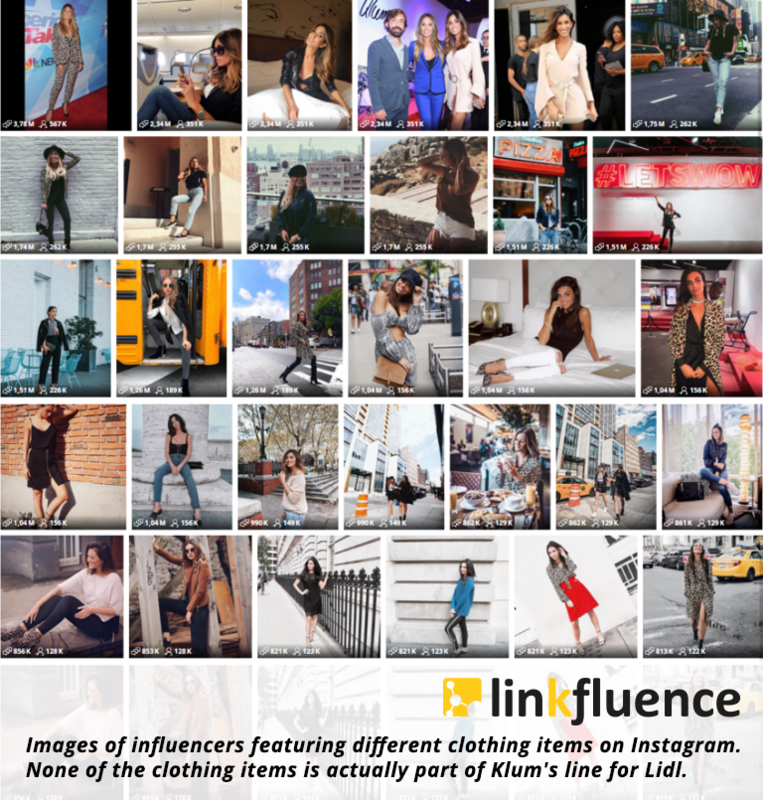 Lidl’s influencer marketing strategy revolved around a number of marketing and sales promotion techniques, including a press release and social media communication, the introduction of a capsule collection at the New York Fashion Week, and a launch in 10,000 of its stores. It was not long before the campaign bore fruit. Thanks to its influencer marketing strategy and a heavy social media focus, Lidl succeeded in penetrating the fashion and beauty market, unchartered territory for the company, where Instagrammers rule supreme. While the first partnerships with celebrities, like Paris Hilton, enabled the retailer to promote its beauty range to a whole new audience on Instagram, the announcement of Heidi Klum and Lidl caused an explosion of conversation on social media since its launch (Twitter, blogs, mass media and Instagram). 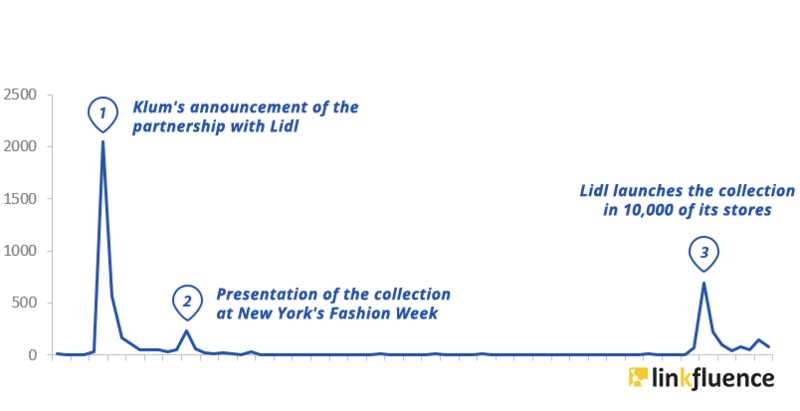 The announcement of the collaboration triggered 50% of all social media conversations mentioning the brand. The promotional support provided by Heidi Klum herself on social media (posts on her personal accounts), most notably Instagram, led to spikes in engagement, with an estimated reach of 1.5 million and giving a boost to classic media posts. Lidl and… Fashion Week?! Yes, you heard it. Lidl chose to make its diversification an event in itself by showcasing the ‘Esmara by Heidi’ collection during New York Fashion Week. Discussed predominantly by women aged 25 to 34, this ‘unexpected alliance’ enabled Lidl to access the fashion and beauty circles, thanks to a group of exclusive influencers who were given a preview of the collection. This teaser strengthened Lidl’s efforts to distance itself from the food discount sector to which it had been limited until that point. 30% of posts used the dedicated hashtags, such as #LETSWOW and #HeidiKlum, amplifying the campaign’s growth. With the influencer marketing strategy in place, Lidl had guaranteed the collection would be well received in store. By analyzing and listening to social media, we could see that at the time the collection was released in-store, consumers were inspired to post about their first purchases and impressions on their own Instagram or Twitter accounts. An analysis of posts showed that the French fell for the perfecto jackets, whereas the Germans preferred the leopard print. Lidl was able to significantly improve its brand social equity and brand image. Leaving behind its discount groceries - much loved by discounters and ‘digital mums’ looking for the best value for money - Lidl is now the talk of fashionistas, aged between 18 and 34, from all backgrounds. 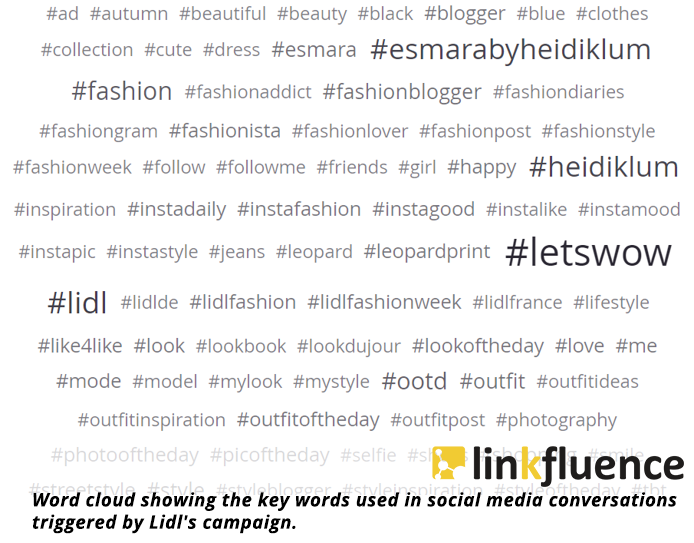 Lidl skilfully penetrated the fashion and beauty scenes thanks to social media amplification. Beside the public comments and posts, we also noticed that Lidl shifted the visual content with which it was previously associated. This case study shows that online reputation and brand image can be driven by a social media influencer marketing strategy and wise choices translating into a careful orchestration of PR, the use of relevant influencers and a scalable plan. Download the full study here and discover more social media insights and analyses. Researching social engagement drivers and knowing who your brand influencers are is vital to improving your brand’s social equity. Discover more about how Linkfluence can help, here.